This white baby dress is an absolute summer favorite! With its multicolored fairground motif it always conjures up a good mood and also surprises you with its many loving details: For example, the pretty decorative pleats, a ribbon at the waist seam or the concealed zipper at the back. 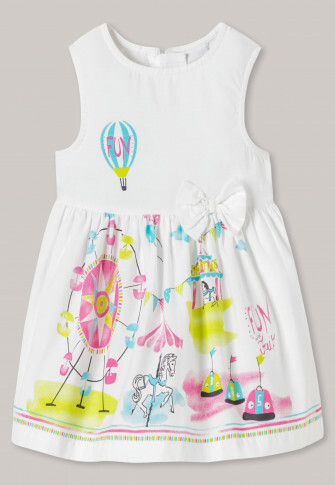 The lined dress is made of high-quality poplin woven fabric and caresses baby's skin with 100% soft cotton. Simply adorable!